Male; Must be a Bachelor’s Degree in Mechanical Engineering; With experience as Mechanic, Enthusiasm requirement analysis, Design skills, Presenting Technical information, Quality focus. Male; Must be a Bachelor’s Degree in Mechanical Engineering; With experience in electrical works and building maintenance; Enthusiasm; with good moral character; Hardworking and can work beyond normal working hours. Male; Technical capacity, problem solving/analysis, decision making, learning/teamwork orientation; Can repair and maintain electronic system as needed. Male; vocational graduate / College level; Work experience in the same position in a manufacturing company is an advantage; Can work with minimum supervision; willing to work overtime and holidays. Previous experience working in a restaurant setting (e.g. dishwasher, busboy/girl, etc.) is preferred; Demonstrated ability to follow verbal instructions and ideas; Ability to follow Health and Safety Procedures; Willing to work in a shifting schedules, holidays and weekends. Candidate must possess at least a Vocational Diploma / Short Course Certificate in any related field; In depth knowledge of using standard hand and power tools; Strong ability to follow oral and written instructions properly; Solid knowledge of installing and maintaining utility systems; Knowledge of precautions necessary for ensuring a safe work environment for self and co-workers; Deep knowledge of basic preventative and general maintenance activities; Willing to work in a shifting schedule, holidays and weekends. Previous experience working in a hotel and restaurant setting (e.g. housekeeper, maintenance worker etc.) is preferred; Knowledge of cleaning and sanitation products, techniques and methods; Demonstrated ability to follow verbal instructions and ideas; Willing to work in a shifting schedule, holidays and weekends. Male; With experience as Lead Man welder / Supervisor; Trustworthy; With TESDA welding certificate; Good communication skills; Thoroughness and attention to details; people oriented person; Physically and mentally fit; Self-motivated, creative; Able to work with flexible working hours. Male / Female; Bachelor’s Degree; With at least one(1) year relevant experience; Computer literate; Possesses mental alertness, flexible and can work under pressure; With relevant training / seminar; With good moral character. Male / Female; Experience in BPO Industry for 1 year or equivalent; Strong phone and verbal communication skills among with active listening; Familiarity with CRM systems and practices; Ability to multitask, set priorities and manage time effectively; Excellent data entry and typing skills. Bachelor of Elementary Education or Secondary Education Major in Biological Science; At least 1 year of working experience specializing in education or equivalent; Ability to work in a team with friendly and caring personality and flexible attitude; Good in English both oral and written. 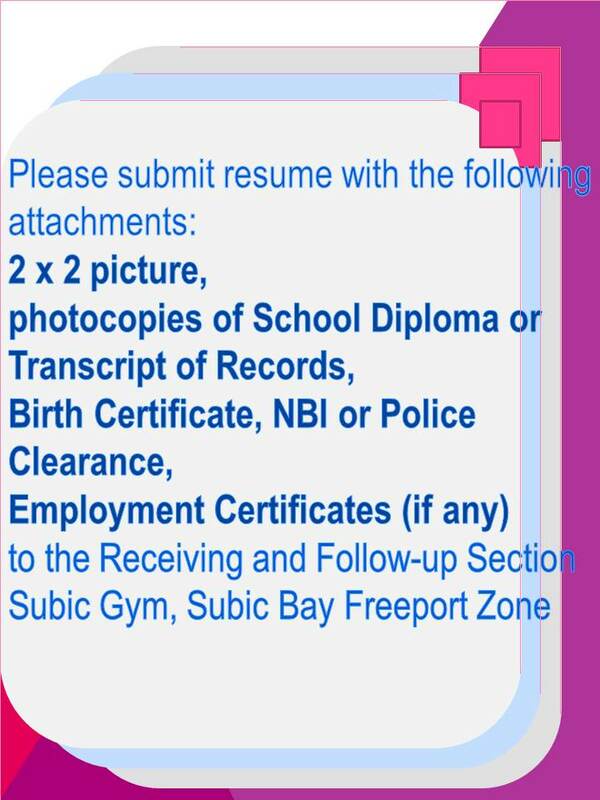 Female; High school graduate/ College graduate / College level; Must be a resident of Olongapo or nearby municipality.